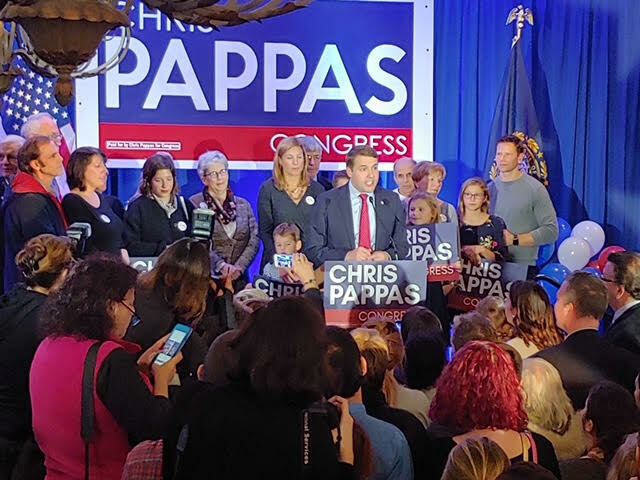 Chris Pappas makes his acceptance speech after being elected to the First U.S. Congressional District. 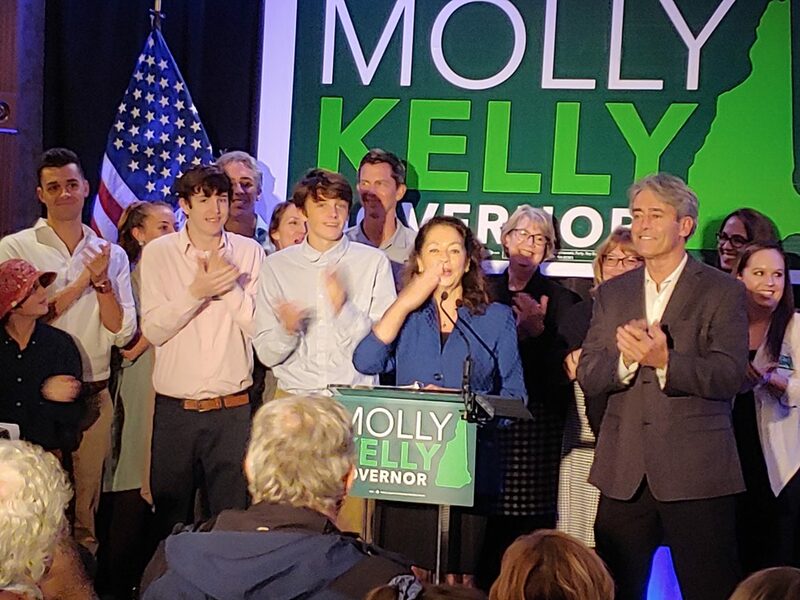 MANCHESTER — The “blue wave” that saw Democrats reclaim a slim majority in the U.S. House of Representatives failed to crest high enough to flip the governor’s office in Concord, as shortly after 10:30 p.m. Democratic challenger Molly Kelly conceded to GOP Gov. 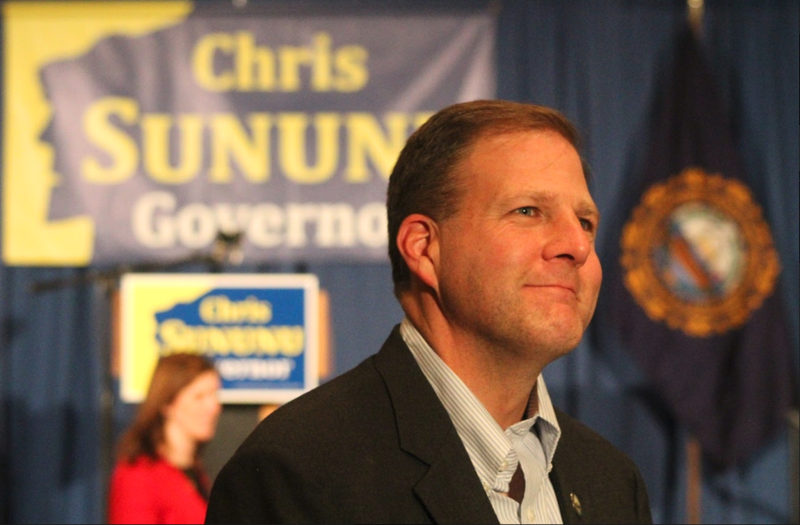 Chris Sununu. The night broke Sununu’s way with the incumbent maintaining a six point cushion as of midnight with 81 percent of precincts reporting, an apparent rebuke of this week’s University of New Hampshire poll projecting a dead heat. Asked earlier Tuesday evening about the poll — hours before results began pouring in — a pair of prescient Saint Anselm College freshmen who spent this fall canvassing for Sununu expressed skepticism. Neil Craffey, who grew up in Lynnfield, Mass., said his time spent knocking on doors for Sununu convinced him a loss was not in the cards. He and Chrisom said they jumped at the chance to volunteer on Sununu’s campaign as soon as they began studies in September. Chrisom said he’s been involved in local campaigns — but nothing like this. Kelly, despite raising more than $1.24 million, could not overcome Sununu. Earlier in the evening, a cautious Sununu, clad in jeans and work boots to accompany a dress shirt and sport coat, told supporters ahead of his reception at Manchester’s Doubletree Hotel he was “hoping” voters would send him back to Concord for a second term. “No matter what happens we’ll have a party tonight,” he said with a laugh. Supporters of Kelly, who gathered along with supporters of Pappas’s Congressional bid at his family’s Puritan Backroom conference center, were initially hopefully as initial returns showed her with a slim lead. As the evening wore on, however, that lead evaporated. Democratic gubernatorial candidate Molly Kelly blows a kiss to her supporters while giving her concession speech. In her concession speech, Kelly said she was proud of her campaign as supporters cheered her name. “I was concerned that the policies of the Trump administration had made their way to New Hampshire,” she said. “Our campaign gave voice to hundreds of thousands of Granite Staters. Pappas will be the state’s first openly gay member of Congress. U.S. Rep. Annie Kuster of Hopkinton defeated state Rep. Steve Negron, a Republican from Nashua, by a wide margin to represent the Second Congressional District.